We all know the typical format for Ignite Liveprool - take 20 slides and talk for 5 minutes about a subject that you are passinate about but now for the brave Ignite Liverpool have started a finale event for each evening where a VOLUNTEER is given an improvisational challenge. The challenge is to take twenty random unseen slides and tell a story throughout. You can check out the first one presented at last months Ignite below by Alex Nursall, who took the topic of Canada as her Improv subject. ACME/Kin2Kin are organising a Creative Marketing workshop whihc will give participants hugely valuable insights into marketing strategy and a range of effective marketing techniques to be used by creative and digital businesses. Designing Your Creative Business (DYCB) is a full day workshop and toolkit for creative entrepreneurs, to help them to design successful creative and digital businesses, and to help established enterprises to grow in a focused way. 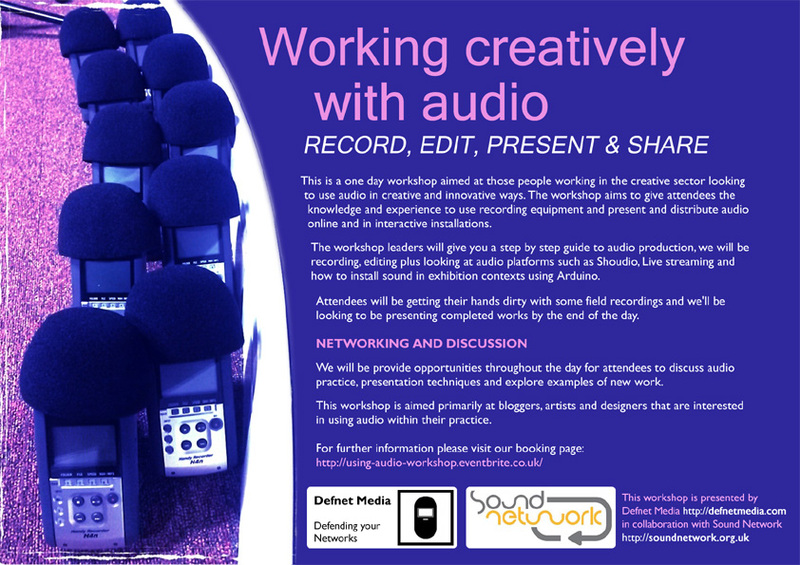 This is a one day workshop aimed at those people working in the creative sector looking to use audio in creative and challenging ways. The workshop aims to give attendees the knowledge and experience to use recording equipment, editing software, Arduino Wav shields and triggers.